Knit first stitch, then second stitch. Those two stitches are now on the needle in right hand. Lift first stitch over second stitch (don’t use your fingers to do it, use tip of needle in your left hand). Now knit the third stitch so you’ll have two stitches on needle in right hand. Lift second stitch over third stitch. Then knit fourth stitch, lift third stitch over fourth stitch and so on. Until you have 1 stitch left on needle in right hand. Break off yarn and pull on last stitch until yarn end slips through stitch. Use the long-tail cast on. 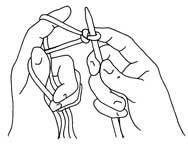 Start with a slip knot (see illustrations below) but don’t make knot at the beginning of your ball of yarn. You’ll need a ‘long tail’ to create cast-on stitches with. To determine length of yarn for tail, use measurement of item you are casting on for and multiply that number by three (for example, for a hat that will measure 20″ around, tail should be 60″ long). your left hand. Hold the yarn tight with your bent fingers. Pick up yarn around thumb with needle in right hand to create an opening, then pull yarn from index finger through the opening towards you. You will have created your second stitch (slip knot counts as first stitch). Repeat these steps until you have cast on number of stitches required for your knitting. Use long-tail cast on (see “Cast on” for illustrations) and cast on number of stitches indicated in the pattern. Circular needles come in different lengths (and in different sizes, of course) and are used to knit in the round with (knitting a tube). A circular needle consists of two short tips (or shafts) connected by a piece of flexible plastic string. The lengths, measuring from tip to tip and including the string, start at 16” and go up to 40”. The circumference of the tube you are knitting determines the length of the circular needle you will need. A sweater knit in the round could measure 48” around, so you would be using a circular needle 40” long. You can scrunch the stitches together and knit that sweater on a 24” circular needle; however, you cannot knit a tube with a circumference smaller than the length of the needle. A hat, for example, will measure about 20” around. You would use a 16” circular needle to knit the hat with, otherwise you would be stretching the hat out over the length of a longer needle. You can also use circular needles to knit back and forth with. Just ignore the fact that the two tips of the needle are attached to each other. There are several advantages to using circular needles over straight needles: knitting big items can be hard on your wrists and hands because every stitch you knit you’ll be lifting the entire knitting with your needles. When you use a circular needle you are only lifting the stitches on the short tips, and the rest of the knitting sits in your lap hanging from the flexible string. And it’s easier to carry your knitting along on the more compact circular needles. And knitting in small spaces (tight armchairs, subway seats) is easier with the shorter needles. And an added bonus: you’ll never loose the ‘other’ needle — because they are attached to each other. Ends and beginnings of yarn have to be darned in. Thread yarn through a darning needle (a needle with a dull tip and a big enough eye to thread yarn through) and, on wrong side of knitting, pick up loops or back of stitches and work – diagonally or sideways – for about 6 stitches. Then cut yarn leaving a ¼” piece. When you are working a sweater in the round, you’ll most likely start at the bottom of the sweater. Then you knit a tube up to the armhole. To create a slit – or opening – for sleeves to be added, you’ll now continue either on the front or on the back by knitting back and forth. First you divide total number of stitches in half – half for the front and half for the back. That’s called dividing number of stitches for armhole (occasionally a pattern will say to add some extra stitches to the front so number of stitches may not be evenly divided in half). If you are working a cardigan in one piece, you’ll be knitting back and forth for the bottom part of the garment up to the armhole. And, again, you’ll have to create slits for sleeves to be added. Now when we divide stitches for armhole we’ll do it as follows: the first quarter goes for the right front, half for the back, and the final quarter for the left front. If my total number of stitches for cardigan is 80 stitches, 20 stitches (one quarter of the stitches) will be for right front, 40 ( half the stitches) for back and 20 stitches for left front = total of 80 stitches. Now when we proceed, we’ll do the right front first – knitting on the first quarter of stitches, then we’ll probably do the left front. And finally finish with the back piece. When casting on for socks, mittens or hat that you’ll be knitting in the round, you can cast on using one needle to transfer the stitches to double-pointed needles. Cast on entire number of stitches, then slide those stitches onto your double-pointed needles. If your set of needles contains 5, divide stitches onto 4 needles and use the fifth needle to knit with; if set contains 4 needles, divide stitches onto 3 needles and use fourth needle to knit with. Double-pointed needles (abbreviated DPN) are short (usually around 7 to 8 inches long) and come in sets of four or five needles. They are used for knitting socks or mittens. Circular needles cannot be used for socks or mittens, because the shortest circular needle is 16 inches long and you cannot use them to knit an item smaller (smaller circumference, that is) than the 16 inches, since you are knitting from tip to tip (or the tube you are knitting would have to be stretched out over the 16 inches). A loop that looks like the letter “e”. That’s the name of the pattern or stitch that you create when you knit back and forth – knitting each row. For example: 5 stitches over pattern = 1 inch Gauge is determined by size of knitting needle and by yarn thickness. Knit a swatch with the size needle you plan to use and yarn recommended in pattern, then measure how many stitches per inch. If gauge is incorrect, adjust needle size (see Needle Size, above). Will hold stitches while you are working on another part of the garment. Transfer stitches that will be idle onto a holding needle or stitch holder. If you use a needle, any needle will work as long as it is the same size or smaller than the needle you are working with (see also: Transfer stitches). Knit to where increase is to be worked. Pick up yarn between stitches with left needle (pick it up from front towards back), then with right needle knit into the back of the yarn over the left needle (by knitting into the back of the yarn over needle, you’ll be twisting the stitch you are knitting and thus avoid creating a gaping hole where you made the new stitch). After finishing a border on a sweater or cuff on a mitten, pattern may say to increase by a set number of stitches. For example, you cast on 120 stitches for the border of the sweater and the pattern calls for 16 rows of a knit 1 purl 1 rib border. Next, the pattern says to increase 10 stitches evenly in the following row (to widen body of sweater) for a new total of 130 stitches. To space the 10 increases evenly, take the total number of stitches and divide them by the number of increases (in our example 120 : 10 = 12). If we knit 12 stitches, work an increase, knit 12 stitches, work an increase, etc. to the end of the row, the last increase would fall at the last stitch — increases would not be evenly spaced. So we do the following: we start by knitting 6 stitches, work the first increase, knit 12 stitches, do the second increase, knit 12 stitches, etc. and our last increase would be 6 stitches away from the end of the row. So we end row with knit 6, the same way that we started row. Now increases are evenly spaced. Sometimes the number of stitches don’t allow for a totally even increase row. Don’t worry: put the extra stitches at the beginning or at the end of the row. Keep spaces between increases along row evenly spaced. Here is how to work increases: knit to where increase is to be worked. Pick up yarn between stitches with left needle (pick it up from front towards back), then with right needle knit into the back of the yarn over the left needle (by knitting into the back of the yarn over needle, you’ll be twisting the stitch you are knitting and thus avoid creating a gaping hole where you made the new stitch). When knitting in the round, after casting on number of stitches indicated in pattern, you join the last stitch to the very first stitch and begin knitting a tube or spiral – round and round. All you really do is pull yarn tight between the last stitch and first stitch you cast on, and start knitting. When you join, make sure all of your stitches face downward and are not twisted around needles or you’ll be knitting a Möbius instead of a mitten. Rib patterns can be written as 1×1, 2×2 or 3×3 (or odd combinations, like 3×1) rib or *k1 p1* rep from * to end of row. What they mean is that you knit 1 stitch, then purl 1 stitch, knit 1, purl 1, etc. ; or knit 2 followed by purl 2, etc. And you repeat the same sequence on the next round to create the ribbing effect. In pattern it is usually written as follows: *knit 1, purl 1* rep from * to end of round; or *k2, p2* rep from * to end of row, or simply 1×1 rib. Knit two stitches together as one stitch. Sometimes the instructions will specify to knit a number of stitches to create a pattern. For instance: *knit 2, purl 6, knit 12, purl 6* rep from * to end of row. Or the number of stitches to knit will indicate the place to work towards; for example: knit 32 stitches then bind off 16 stitches for neckline. Knitting in the round creates a seamless tube. Socks, hats, mittens and even sleeves are all knit in the round, using double-pointed or circular needles. Knitting in the round means knitting a spiral — your last stitch is joined to the first stitch. you knit into the stitch below (see illustration). Squeeze out as much water as possible (never wring woolens). Then stretch to final size on a flat surface and let garment air dry. Use a spare needle or a stitch holder and transfer stitches onto it. Leaving stitches on a holding needle lets you work on another part of the garment. For example: you could be finishing the left and right fronts of a cardigan, while stitches on back are on a holding needle. Any soap with a neutral pH is considered mild. Never use detergents when washing woolens, they are too alkaline and could harm wool. Wash in warm water, rinse in warm water. When you create a neckline on a sweater, you start by binding off a number of stitches in the middle of the front where the neckline begins. Then you continue either on the left or the right side of the neck and gradually work decreases to create a rounded edge for the neckline towards the shoulder. It will be written as follows: knit – or work in pattern – [number] of stitches, bind off [number of] stitches in the middle, then knit to end of row. Continue on right front and at neck edge bind off 4 (or any number of) stitches 1x, 3 stitches 2x, 1 stitch 4x. This means that you are now finishing the right side of the neck first. With right side facing you, you’ll continue the left side of the neckline (this is a little confusing, but in a knitting pattern when you refer to the right or the left side of a cardigan or the neckline on a sweater, it is the left as if you were wearing the garment, not looking at it). You now have two edges: on the left the armhole edge and on the right where the neckline will be created. Turn and work – on wrong side – back to the neckline edge where you did the bind-off for the middle stitches. Turn and bind off the first 4 stitches, then work to end of row towards armhole edge. Turn again and work to neckline edge. Turn and now do your next decrease — in our case bind off 3 stitches. And this decrease we will repeat on the next go-around (because patterns says to do it 2x). First you work to end of row. Turn and work (on back) to neckline, turn and now bind off 3 stitches again. That’s what is meant by binding off 3 stitches 2x. Next, continue and bind off 1 stitch 4x (which will be over 8 rows, since each decrease happens only every other row at the neckline). For example: #3 or #4 (or size to obtain correct gauge) If you knit continental style (pulling yarn through stitch with needle in right hand), usually the smaller needle size applies; and if you knit American style (wrapping yarn around needle), the larger needle size will apply. The idea behind needle size is to get the proper gauge, and the correct gauge is essential for proper fit. Imagine a hat: pattern states to cast on 90 stitches and the correct gauge is 5 stitches per inch. That means that 90 stitches, divided by 5, will give you a hat circumference of 18” (child’s head). If your gauge is off by ½ stitch — your swatch measures 5½ stitches = 1 inch. The arithmetic for the hat is off: 90 : 5½ = 16” (that’s the size of a baby hat). And if your gauge is more like 4½ stitches per inch, the size of the hat will be 90 : 4 ½ = 20” (now we have a hat that fits an adult). Needle size, type of yarn, and your style of knitting determine gauge. So, knit a swatch, then measure swatch and adjust needle size, if necessary (if your gauge is higher – 5½ instead of 5 — use a larger needle, because your stitches are too tight; if your swatch shows 4½ stitches per inch, you need to use a smaller needle, because your stitches are too large). Knitting needles come in different thicknesses, lengths, styles and materials. The choice of material is a personal matter – some like to knit with wooden needles, others prefer aluminum or any of the other materials. Thickness, length and style are largely determined by what you plan to knit. A big bulky sweater requires a thick and long needle, and a pair of socks is knit on a set of double-pointed needles. Patterns will specify the thickness, or size at is called, of the needle. Some patterns give a choice of sizes, one slightly larger than the other. That’s because there are different ways to knit – some methods produce a tighter stitch (knitting the American way by wrapping yarn around needle, for instance) while knitting the continental way (pulling yarn through stitch with right needle) will produce a looser and slightly larger stitch. Pick the larger size needle if you knit the American way; and choose the smaller size for continental knitting. The size of the needle will determine the gauge of your knitting (see: Gauge, page 3). The correct gauge is crucial to the success of your knitting, otherwise the sweater or hat you are planning to knit will turn out too small or too large. Turn knitting so stitches you just knit are in left hand. in right hand onto needle in left hand, etc. After you cast on the required number of stitches, turn knitting so cast-on stitches are in your right hand, and continue with pattern. For example, if you want to knit a border around a baby blanket or for left and right borders along front on a cardigan or coat. Pick up 1 stitch per 2 rows or follow directions in pattern. Pattern may call for extra stitch every fourth stitch or fifth stitch. In that case, pick up 4 stitches over 8 rows (1 stitch per 2 rows), then pick up the extra stitch on next row instead of skipping row. Always pick up stitches right side facing you. Pick up stitches by pulling yarn from back towards you through edge stitch. This applies to dropped shoulders only, where the edge around armhole is straight. Right side facing you, start at underarm position and pick up 1 stitch per 2 rows on garment. Pick up 1 extra stitch at shoulder and 1 or 2 extra stitches at underarm position. Pick up stitches by pulling yarn from back towards you through edge or selvedge stitches around armhole. To knit a border around a neckline, pick up stitches (you’ll have to use a circular needle or double-pointed needles because you’ll be working the neckline in the round) around the entire neck opening as follows: right side facing out – facing you – start at one of the shoulders and pick up 1 stitch per stitch on garment. If you decreased 12 stitches for neckline (in increments of 3, then 2, then 1, etc.) you’ll be picking up 12 stitches right above the decreases. If you worked straight rows without decreases on neckline, pick up 1 stitch per 2 rows. Pick up stitches by pulling yarn from back towards you< through edge of stitch. Pick up 1 extra stitch at each shoulder. Then follow pattern for neckline border. Used to mark a place in your knitting. Examples: to mark the beginning of the round when knitting in the round; to remind you of the beginning of a pattern sequence; or to mark where a decrease should be, etc. As markers you can use little plastic rings sold in yarn stores or you can use a short piece of different-colored yarn or a paper clip. In some patterns you’ll have to shift the marker every row or round, or replace it after knitting two stitches together (for a decrease). At the tip of mittens, socks or hats, you may have a few stitches left after finishing the decreases. Break off yarn (leaving about 6”) and – using a darning needle – pull yarn through remaining stitches and, ending on wrong side, darn in end. *knit 2, purl 6, knit 12, purl 6* rep from * to end of row. Or the number of stitches to knit will indicate the place to work towards; for example: knit 32 stitches then bind off 16 stitches for neckline. If the pattern instructions specify to Purl [number of] stitches, then purl, instead of knitting them. For left front (wearing it) or right front (looking at it), our neck edge is at left and the armhole edge at right. So we work the decreases at the beginning of the row on the wrong side, working towards armhole edge. *k2, p2* rep from * to end of round; you’ll be knitting two stitches, purling two stitches, knitting two, purling two, etc. to end of round, ending with purl two. or knit 2 followed by purl 2, etc. And you repeat the same sequence on the next. The right side of the garment you are knitting is facing you. It’s called a row when you knit back and forth, using two needles. When you get to the end of the row – when you knit the last stitch on the needle – you turn knitting from left to right and your last stitch will be the first one on your next row. And it’s called a round when you are knitting in the round using double-pointed or circular needles. You are knitting spiralshaped rounds into a tube and your last stitch is connected to your first stitch. For example: Adult small, medium and large (larger sizes in parenthesis). If sizes are given as small, medium and large, the directions for medium and large will be in parenthesis throughout pattern. If only one number is indicated, it applies to all sizes. If you have finished a skein of yarn and are ready to start a new one, knit three stitches with old and new yarn together, then drop old yarn and continue with new skein. Leave ends about 1” long of old and beginning of new skein sticking out on wrong side of knitting. Don’t cut the ends shorter than 1 inch, otherwise they’ll work their way to the right side when knit garment is stretched. Don ‘t join bulky yarn this way – it is too thick to double. Start the new skein of Bulky by leaving a short (6”) tail of the old skein and simply start the new skein by leaving a 6” tail, then knit your next stitch. When you are finished with the project, tie the two ends together on the back side. That’s the name of the pattern you create when you are working back and forth – knitting uneven rows and purling even rows. Usually the knit side will become the right side of your garment, and the purl side the wrong side. Switch to double-pointed needles when circumference gets too small. If you are knitting a hat in the round using a 16” long circular needle and if pattern calls for decreases at tip of hat, you may have to change to double-pointed needles when circumference of hat becomes too narrow for 16” long needle (otherwise you’ll be stretching the hat out too much). If you are knitting with two or more yarn colors, the pattern will tell you when to switch to another color. Usually the color you start with will be called color A, the second color you’ll be working with, is color B, and so forth. Instead of knitting them, a pattern may instruct you to transfer a number of stitches. Transferring a stitch means you slide stitch onto a new needle without knitting or purling it. You put the needle you are transferring stitch onto tip to tip with the needle that holds the stitches, and you simply transfer stitch from old needle onto the new needle (it is also called transferring a stitch as if to purl stitch). When you are knitting back and forth using two needles, the stitches to be worked on are on the needle in your left hand. You’ll use the needle in the right hand to knit stitches off the other needle. As you are knitting, the stitches are transferred to the needle in the right hand. When you get to the end of the row – you’ll have knit the last stitch – you switch needles. The needle with all the stitches is transferred to your left hand, the empty needle goes into your right hand. The ball of yarn is where you knit the last stitch and this last stitch will become the first stitch on your next row. In order to do that, turn the knitting from left to right. Now the last stitch will be the first stitch on your next row on the needle in your left hand. Sometimes a pattern calls for using yarn double. That means you’ll be working with two skeins simultaneously. Don’t wind the two skeins together into one ball, because if you encounter a knot in one skein and break the yarn at the knot, it will be impossible to line up the two strands of yarn again. Knitting yarn comes in several shapes: as a skein or a hank in a bundle of loops or strands tied together in one of two places; on cones; or already wound into a ball. A skein or a hank of yarn needs to be wound into a ball before knitting with it. Take the skein and find the place where the bundle of loops is tied together. Make sure that none of the loops are twisted, and that all the strands are pointing in the right direction: from the tie the strands are going to the left or to the right. None of them should cross over at the tie. Stretch skein over your two outstretched arms and give it a good yank or two to straighten out strands fully. Then put the skein around the back of a chair. The tie is the beginning and end of the skein of yarn. Untie or break the knot, and start winding with one end (it doesn’t matter which end). Wind the yarn around your hand loosely, about two dozen times. Then pull the bundle off your hand; and – holding the bundle in your hand with the loops parallel to your fingers – start wrapping the yarn again, this time around your fingers with the bundle of yarn, wrapping them together. Pull the wrapped yarn with bundle off your fingers; and – holding it in your hand – start wrapping yarn around your fingers and bundle again. Keep repeating these steps until you have wound the entire skein into a ball. If you are knitting back and forth and you are working with more than one yarn color, a pattern may call for a single row in a color and you end up with yarn color you just finished with at one end of the needle, and yarn color to continue with at the other end. Use a circular needle for this pattern, then you simply slide stitches to the other end of the needle, pick up the new yarn color at that end and continue knitting. If you use single point needles with knobs at one end, you would have to transfer the stitches onto a new needle in order to be able to continue knitting with the yarn color at the end of the needle with the knob. Yarn over needle (usually followed by knit 2 together) could be part of a pattern, or could create a buttonhole or an eyelet hole (to thread ribbon through later). Bring yarn forward and over needle in your right hand, then insert needle into next stitch to be knit (or purled, according to your pattern). On next row, you’ll be working yarn-over as a regular stitch.